PESA Advisory Board Member Sanjiv Shah, Managing Director, Simmons & Company International, with Molly Determan, VP Communications & Member Relations, PESA. 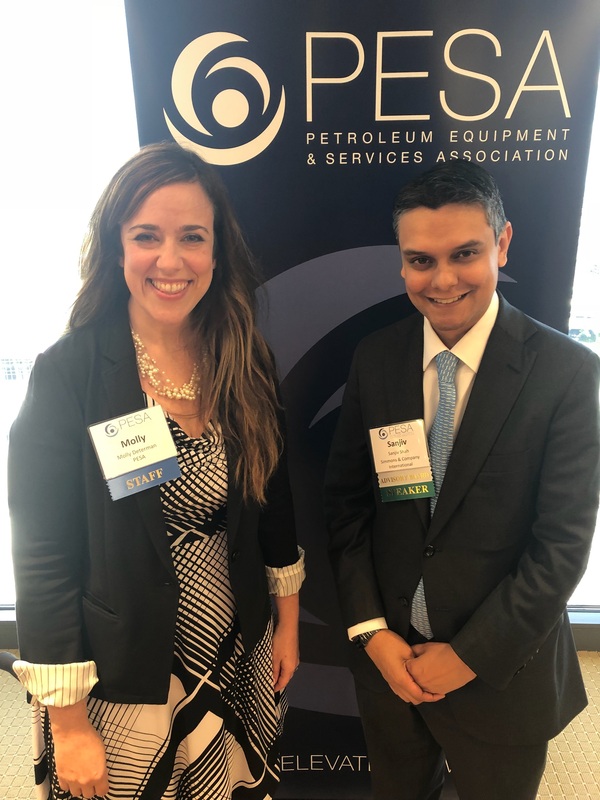 On June 7, the PESA Emerging Executives Committee hosted its bimonthly leadership forum with PESA Advisory Board Member Sanjiv Shah, Managing Director, Investment Banking, Simmons & Company International®, Energy Specialists of Piper Jaffray®. Shah shared his thoughts and insights on leveraging your personal brand and effective networking skills for career progression. Shah outlined how one can develop his or her career through effective personal branding. Ask yourself: How would your boss describe you? Build your image around your ideal answer. Be sure to differentiate yourself while focusing on what your company needs from you. Shah also explained the importance of expressing professional goals to decision makers and superiors, followed by hard work to prove that you can advance to the next level in your career. For Shah, answering emails within 30 seconds, working 365 days per year, and being available 24 hours a day for customer calls were key to developing his executive presence and personal brand in his first year at the firm. After gaining tenure and moving into management, he then focused more on work-life balance. Being known as the go-to guy and a solution provider, in addition to always being available to superiors and colleagues, contributed to Shah’s positive personal brand. Shah reminded attendees not to fear their own ambition. If you want a new position or promotion, make your ambitions known to your management and ask what you need to do to get there. Shah addressed being challenged by staff senior in tenure, position and age to him. He explained that developing a network of superiors can help mitigate these issues. One participant acknowledged this advice was something they could implement immediately in their own role. According to Shah, attending as many networking events as possible can help build and maintain a broad network that will grow with your career. “Don’t build a network to try to use people,” he emphasized. “What has worked for me is to go into a networking event without an agenda, just have a conversation without pitching.” Pitching, he warned, just makes people mad. “Building trust is important and can be achieved through integrity and honesty,” said Shah. “It is refreshing to hear from a young leader that spoke primarily of relationships. The focus was not about wins or achievements, but about the people in which you surround yourself,” said one Leadership Forum participant. Leadership forums allow Member Company high performers to interact with industry executives through open dialogue structured around a targeted theme. The next leadership forum in the series will be presented by PESA Advisory Board Member Craig Lange, Global Strategy and Growth Business Director, Caterpillar Oil & Gas.